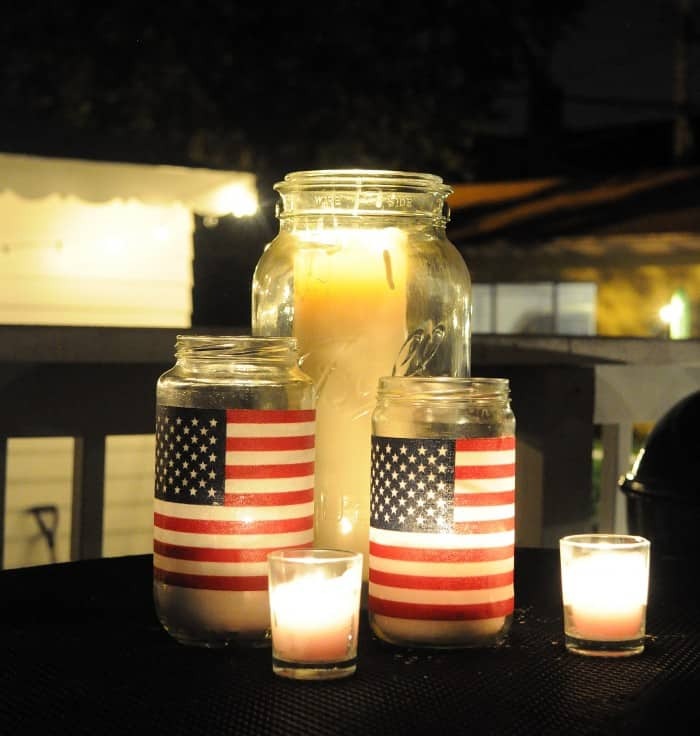 These American flag DIY lanterns are perfect for the 4th of July or Memorial Day! 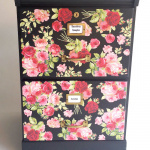 This project is super simple and inexpensive. Make these mason jar lanterns in just a few minutes. Skills Required: Very Beginner. 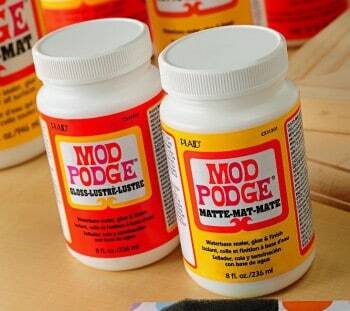 You don't need any Mod Podge experience or, to be honest, any crafting experience at all. 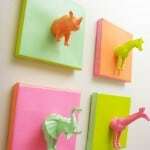 Even kids can make these. This is Cheryl from a pretty cool life! These mason jar lanterns are a project that is super simple and that you can complete for just a few dollars, but it still has a huge impact. 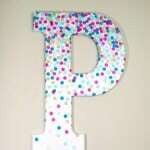 They're perfect for setting a festive and patriotic atmosphere for 4th of July, Memorial Day, or Veteran's Day parties! Use these DIY lanterns as a centerpiece for a BBQ, line a walkway with them, or put them on a mantel. The flags I purchased come in a pack, for an individual cost of approximately $.75 each. Jars range between $1 – $2, for total cost of $1.75 – $2.75 per lantern (I already have my Mod Podge on hand). Having said that, obviously if you use recycled jars, you're only going to spend money on the flags. That's pretty inexpensive patriotic decor! I love it. 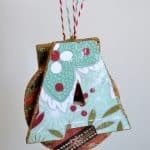 The small flags are typically 4″ tall x 6″ wide, so you'll want to find jars that are at least that size (a 6″ circumference) so that you won't have to trim the flag. 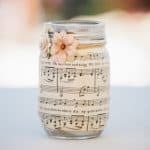 You also want to make sure the jars have a wide enough mouth that you are able to light the candles you put in them, if you choose to use real candles (versus votives or LEDs). I actually like combining a bunch of different size jars, especially those of the mason variety. I like using 16-ounce, 32-ounce, and 64-ounce mason jars. I typically get all of my mason jars from Michaels. If you choose to use recycled jars, you'll want to remove the labels. I have a great post on DIY sticker remover you're going to want to check out – I recommend 10 non-toxic methods that I gathered after surveying my audience. Use their advice and you'll have those labels off in no time! 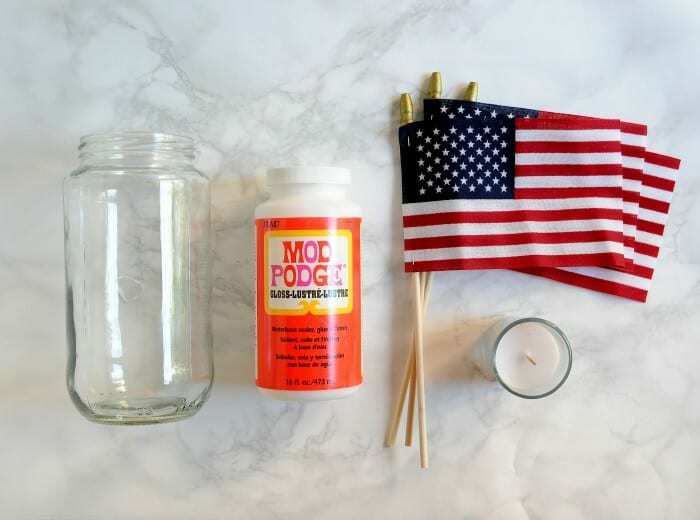 After label removal, you're ready to make your patriotic DIY lanterns. Here's how they're done. 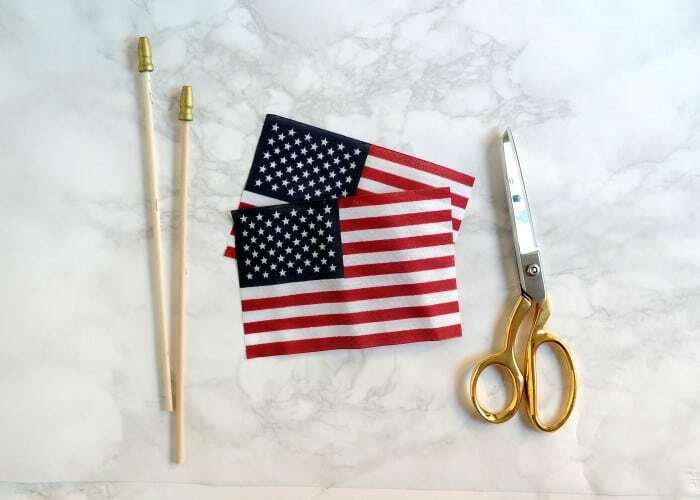 Start by carefully removing the flags from the wood dowel rods using scissors or a craft knife. 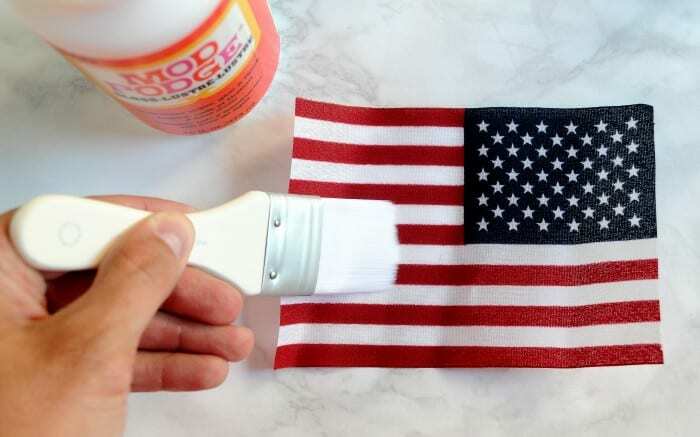 Apply a thin layer of Mod Podge to the back of a flag. 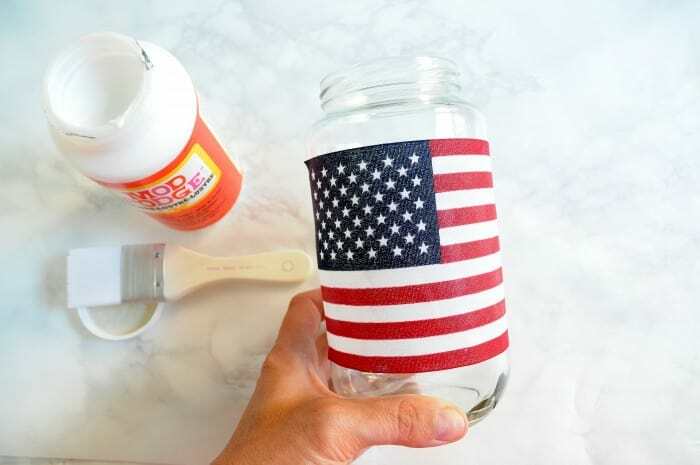 Position the flag evenly on a jar, smoothing any wrinkles or air bubbles that may form. Repeat with additional jars and let dry. Then apply a thin layer of Mod Podge atop each flag to seal it to the jar. After the jars have dried, place a candle in each. If your jars have a bit of a bump in the bottom, you may want to pour a bit of sand in the bottoms and nestle the candles in the sand. 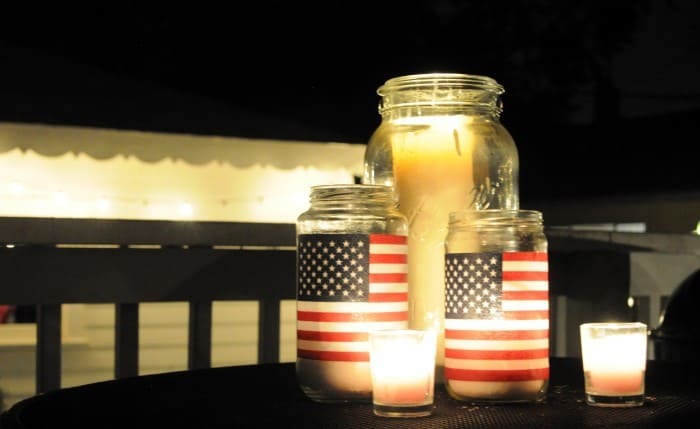 Your patriotic mason jar lanterns are complete! Not only are these patriotic lanterns perfect for a 4th of July party, but I can also picture them at summer celebration of any time (wouldn't they be awesome by a pool?) or even a wedding! I'm wondering if a couple having a military wedding would enjoy these as a special touch? You can use Mod Podge Outdoor if you want to leave these mason jar lanterns out and make them a bit more durable for the rain or sun. Dishwasher Safe is fine to use too. If you live in extreme weather, you might want to consider a waterproof sealer from the hardware store – maybe even a UV spray. That will increase the cost of the project of course, so I'll leave that up to you. 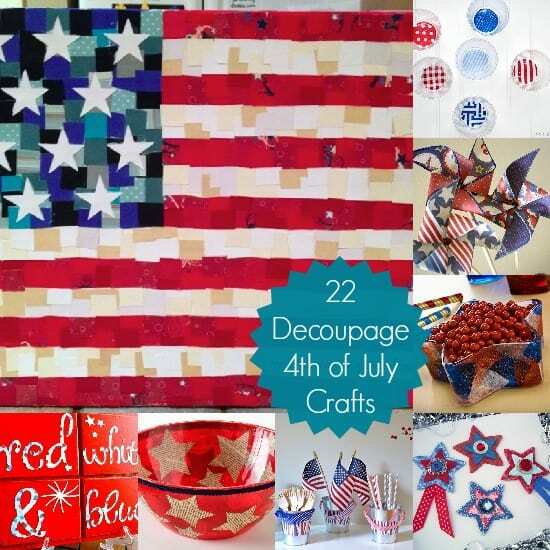 If you enjoy this 4th of July decor idea, I'd love for you to check out our 22 Fourth of July crafts using Mod Podge. Just click the image below to view them! Loved this idea! Thank you.